The key can be installed during the developer's kit installation when prompted, or at a later time by using the DBPix context (right-click) menu [ figure 1 ]. To use the menu, open a DBPix form or web page (eg in the Access sample or in your own application) - note: open forms in Runtime/View mode, not design mode. 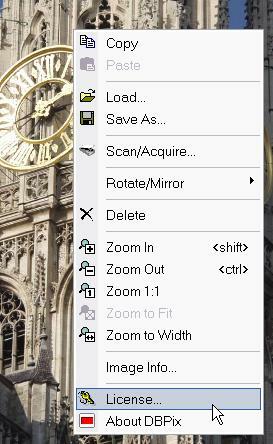 Right-click on the DBPix control to display the context-menu, and choose 'License' to display the License dialog box [ figure 2 ], which allows you to add, change or remove your license key. After entering your key, check that the 'Key Type' text shows the correct type.